I will not be mentioning the company responsible for this as to not use this platform to slander their name and also because I forgot. Early on in the week, we received news from our wonderful neighbors, the Frankes, that a bomb was found near a major highway and they have that highway – and two other major highways – shut down to investigate and defuse it. Of course, bomb defusal is a surgical procedure and takes many hours, so it wasn’t until the end of the day that we got word that it was not, in fact, a bomb, but a traffic counter. The irony of it is that the company that found it, reported it, and shut down all the highways was the same company that put it there and forgot about it. The double irony was that the counter was put there to collect data. That data probably wasn’t very helpful after they shut down all the highways. Something tells me that, over the course of several hours early on in the week, there’s going to be an outlier in their graph. Way to go Anonymous Company. Data collection successful. In other news: life is good, Phoenix is hot. I don’t mean to fill you all with envy, but the weather here has seriously been awesome. We just got back from vacation (which I think you can read about in the last blog?) and now we’re jumping back into things. We had our last Unite Phoenix on Saturday (For those of you who don’t know or can’t remember what Unite Phoenix is, it’s an event that takes place on one Saturday every month in which churches, college students, and other individuals come together to serve. Many ministries, including Aim Right, are represented). It’s sad to think that this is it for us, but I’m also encouraged seeing the growth in numbers each month and knowing that God has big plans for that event. I want to take that idea home with me and chew on it. Maybe God can use someone like me to unite the church where I live, bringing together people of different denominations, backgrounds, age groups, races, etc. and spend one Saturday a month serving with one another. The passage in scripture where Jesus washes the disciples’ feet always baffles me. John explains that Jesus has this realization that He’s going to die soon. In that moment, knowing his time with his disciples was coming to a close, he got up from dinner and washed their feet. Amazing. If I had that same realization, I would be booking trips and spending money on myself, trying to enjoy my final moments. Not Jesus. Jesus humbly served those around Him. Incredible. I want to take that home with me. At any moment, I could die. This is true for all of us. Why don’t we take advantage of our remaining days on earth and humbly serve those around us? I think that’d make God smile. I hope everyone reading is ready with their stat books, because next you’ll be reading about sports updates from Phoenix. I have two games to cover, first of which will be Kelly’s volleyball game. Tragically, Kelly’s team has fallen short of victory, and Kelly even showed up at the right park this time. I suppose it’s too much to ask that she single-handedly carries her team to victory every week, but I think that’s where we’re at. Secondly, my soccer team had it’s division final on Sunday night. We lost. We went to double overtime, losing in penalties, but it was still a lot of fun. It’s been a pleasure playing with those guys. This has been sports updates in Phoenix. And now for movie reviews: Shazam was pretty funny. I want to conclude this blog by thanking everyone who reads them. It’s truly humbling hearing from all the people who read these and are interested in the work that God is doing here in Phoenix. It means the world to us that you care enough to keep up with what we’re doing and keep us in your prayers. That being said, it is from the bottom of my heart that I say, thank you. If you want to keep us in your prayers, we do still have a month of service here left. Please pray that we remain present where our feet are. It’s easy to autopilot near the end like this and focus on what’s coming next, but we pray that God continues to energize us for the work that’s left to do here. Also, coming up soon is our Grand Canyon hike. Pray for our physical strength as we prepare for that. And Easter is going to be an exciting time here in Phoenix. 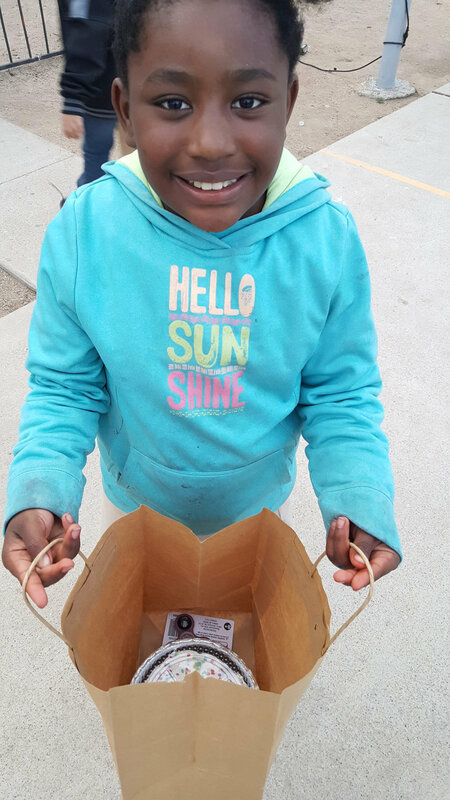 We’ve bought and – with the help of Unite Phoenix volunteers – filled 10,000 plastic Easter eggs for a giant Easter egg hunt for the children in the community. We’ll also be taking the opportunity to tell people about the Easter service that a local church is hosting at Aim Right. We’re trying to pack out our sanctuary with families from the community who ordinarily wouldn’t attend church on Sunday. Pray that God shows up big for these events and reveals Himself to people who don’t know Him. Thank you all again for reading and praying. Since our time here is running out, this is the last blog post that will be written by me, personally. There will still be weekly blogs until we leave, but this is the last one I’ll be writing. It’s been a pleasure writing for you all, I hope you’ve enjoyed reading. The beginning of the week we celebrated Connor and Katie's birthdays. We were in Mexico for Connor's, and Katie's was April 1st. Obviously we had to give Katie a hard time since her birthday lands on April Fool's day. Stephanie made two pies, one raisin and one peanut butter. We gave Katie the raisin pie having her think it's yummy peanut butter pie. We were hoping to get a reaction out of her and only got "my mom's peanut butter pie is better." She was a good sport about it even a good sport after she got cake smashed into her face. Thursday began our team vacation. Briana and I chose Tucson for our destination. We wanted to make sure we still had nice warm weather and have access to a pool. Our vacation consists of movies, the show Parks and Rec, the pool, reading, puzzles, and lots of yummy food! Our first full day of vacation was by far the laziest for me. I regret not wearing my watch to see how little of steps I took that day. Since I'm on vacation it has given me a lot of time to think. I think about how we only have almost a month left and how bittersweet it is. I have been really missing family, friends, and of course my cats. But, I have also been thinking about how I felt the first time I finished the program 2 years ago. I had a lot of thoughts about how I wish I would have worked harder in Montana (my outreach location). How I wished I would have spent more time with this person during training or this person during outreach. Or how I could have inserted myself more with others who don't know my Father. I'm sure I'll have these thoughts and more when I'm done this time around. We as humans are hard to please. Those sad wishful thoughts of me doing more my first time through the program helps me to live in the moment because some day I will look back and cry about how much I miss my time here serving with Aim Right. Missing all these wonderful people I have grown to love even through short conversations. - we have always been more of a kidding around group. So, more realness and respect for one another. - having almost one month left causes so many emotions. It leads to thinking about how sad saying goodbye to everyone will be, emotions about seeing the other teams, family, and other friends, and also leads to thinking about plans for the future. Home. We all have one. I have called many places home for various amount of times. What makes a home a home? Is it the location? The vicinity it is to your family? The coziness of the interior? Or is it partially the confidence you get from knowing you are where God wants you? This is an interesting way to start off the blog, I realize that, but this train of thought has come from something that an intern whom we met at i6eight (the ministry we helped in Mexico, see the last blog) said. This intern has recently become a Mexican resident and is going to a training center in Southern Mexico for a year to learn how to reach one of the several hundred unreached people groups within Mexico. Now before someone corrects me and lets me know that, of course God won’t let that people group go without the opportunity of hearing about Jesus. After all he won’t come back until every tribe and tongue has had said opportunity. Well, yes that is true. But he has been called to go to that group of people and if he doesn’t go, God isn’t going to just let them slip under the radar, he will send another person to go. But isn’t it better if we just trust in God’s goodness and follow where he leads us? This now leads to my point and to the title of this blog. Isn’t wherever God calls us home? It may not feel homey or even comfortable. But will we ever actually, truly feel at home anywhere on this earth? We weren’t created for an eternity spent on this large ball of magna, dirt and water. At least we weren’t created to be here alone. We were created to spend our eternity with God in His perfect home. But when we disobeyed, we were separated from God by our sin. And that feeling of home? Gone. Until one day, when our Saviour comes riding through the clouds or we are carried home. Then. Restoration and the ultimate peace of being home. We strive so hard to make our houses feel like a home and sometimes we even feel perfectly at home. We have those moments in our physical homes but also when we are in deep communion with our God. And I think those are special moments given to us as gifts and as a reassurance that we will one day be at home. So, where is my home? Is it here in Phoenix where I spent a chunk of my childhood and I’m currently living? Is it in northern IN where my family lives and I have spent the majority of my life? Is it in a small apartment in Granada, Spain where I really started to fall in love with God? Is it in a coastal city of Ecuador where I helped take care of children for 3 months? Or is it in a brand new place that I have never visited? Yes, to all of the above! Home is where God has placed me and where he has me to serve and glorify him. And so as I continue to live in this home in Phoenix that I have right now, I pray that I won’t be constantly looking to the future and wishing I was in my other “home”. But that instead I will be content learning and living here and spending time with the students we spend so much time with and with my teammates. I pray that I will, as apostle Paul put it, learn to be content in any and every situation. Whether well fed or hungry, whether living in plenty or in want. And also to make my home wherever God calls me. God is so good all the time. All the time, God is good. That we would still be fully invested here and not mentally check out. That we would be faithful in sharing God’s love as we have opportunity in words and actions. That God would continue to work in the hearts of the kids and teens that we interact with daily. Hello everybody, its Rey Rey! So what did we do for spring break?? Well, what every teen loves to do – go to Mexico. But it wasn’t all beaches and vacation. We were able to help an organization build houses and were able to be a part of changing lives. We left Thursday afternoon around lunch and picked up a girl who had wanted to come since her brother was already down there building houses. It was about a 4 hour trip down to Mexico and the time passed by fairly quickly, despite the fact that most everyone was quiet. We arrived there around 5 that night and got there just in time to see the group that had been at the center leave. Let me tell you, that group really scared me. The one kid I talked to the most of the night talked about how he’d only had maybe three showers the whole three days he had been there and how the tents they slept in had not been great. However our group got lucky and were named interns for ten days, so the guys and I got to sleep in the guys’ intern house and the girls got to sleep in the girls’ intern house. On Friday we started our first house. The group that was supposed to help us had said they didn’t want to dig the hole for the septic or lay the concrete for the floor, so we got to do that ourselves. We spent that first day until around 2pm working on those tasks. The next day the group was supposed to be there around 1pm, so we just leveled the ground around the house and did some work on a bakery. Well, 1pm rolled around and the group didn’t show up, so we started cutting the boards for the frames; however, the place we were at didn’t have any power tools so we did everything by hand. After about two hours we had everything cut and ready to go, and right when we were about to leave, the other group showed up. The director let us go, though, and had the other group start putting the frames together. After we left the construction site, we went to the beach and chilled there for a while. The next day was a big day; the other group was there and it was time to raise the walls. We got the walls raised, wood put on, and a bit of tar paper put up (if I remember right). The next day we put up the rest of the tar paper, then the chicken wire, and then started doing the stucco. That night we had the fiesta night. Let me explain what fiesta night is. It’s the night that we get together with the family we’re building the house for and have a small party with a piñata, music, and dancing. All in all, it’s a blast. The next morning was the dedication for the house. We sang songs and had communion in the house as its first meal – it was a great experience. After that we finished the house, then went back to base and slept. The next day was Wednesday, which is their Sabbath, so we went to church. After church we visited a dirt mall, which is a street lined with souvenir shops, and then we went to the beach and relaxed all day. On Thursday the next group arrived, which was actually a group from here in the valley. They didn’t do any work that day as it was just our group getting the site of the house prepped. We laid the floor and built the frames the first day, then the second day we put the walls up (for the most part the septic was in the back of the house and was too close so we had to wait for that task). That night was the fiesta, which was again great. I love fiesta night. Sunday was our last day there, so we helped out with the house once more. Then we packed up and went to the dedication of the house before saying our goodbyes to the interns that we had met down there. That was really hard because we had all became really good friends. Getting back over the border went really well and we got back to Phoenix around 5:30pm. At 5:45, we had to say to good-bye to the girl we had picked up. She was a blast to get to know and we were all really happy she got to come with us. She should be reading this, so shout out to her! Also to the interns that we met down there, you’re awesome and we love you! Hello everyone! Team Phoenix is in Mexico!! Before we get too excited about Mexico, let’s go back to the beginning of the week in Phoenix. Sunday afternoon we were joined by a group from Texas. They were in charge of VBS for the week, and we were there to help if needed. VBS was Monday- Thursday in the afternoons; before VBS the group joined us in doing work projects. Most of our time in the mornings was spent repainting the majority of the main floor of the church, excluding the sanctuary. Right after painting we loaded up the bus and vans with kids and brought them back to the church for VBS. Wednesday night, a couple hours after VBS, we had what was called a block party. All of our kids were invited to bring their families for a party! We had bounce houses, cotton candy, hot dogs and even a dance party. The night was a huge success! Thursday, right before VBS, the team loaded all of our things into a fifteen passenger van and headed for MEXICO!! After a four hour drive and a slight mix up with the directions in Mexico, we arrived at our destination. Friday we started off by laying a foundation and digging a septic hole for the house we will be helping to build this next week. After we were finished working at the building site (and got cleaned up of course), we headed to grab lunch (Mexican quesadillas are my new favorite thing) and then went to the beach. We stayed at the beach for hours and then explored a Mexican store. Needless to say our day was very nice. We are all very excited to be in Mexico and can’t wait to see what stories we come back with. You’ll have to wait until next week to hear more about our adventures from Mexico. For now I will say goodbye and until next time. This is Briana coming at you live and a bit chilly from the desert of Phoenix. This past week the weather has been a bit chilly, we even had a day and night of rain which cooled the air considerably. But oh! The fresh air that rain always brings makes the grey overcast day so worth it. There is something so clean and refreshing when you can smell the grime and dust of a city being washed away. I guess that is kind of how it is in our lives. How clean and refreshing it feels when we are washed clean by the sacrifice and grace given to us by our Savior. How much sweeter it makes each day when we remember that. I have been reminded a lot lately about the importance of constantly turning my focus and attention back to our Father throughout the day. We start our days off with an hour of quiet time to be alone with our Father and to listen, read the Bible and talk to Him. But so often that is where I leave it, I forget to be in constant conversation with Him throughout our day. But the difference it makes when I am in constant dialogue with our Father makes a difference to my attitude, my clarity of thinking, and my patience with others. Anyways, so that is a little bit of what my Father has been teaching me. This past week was an pretty average week schedule wise except for Wednesday night. On Wednesday we have Kingdom Kids, which is a Bible club for elementary age kids. Usually the night consists of singing songs as an entire group, having a few announcements and then splitting off into different age groups for classes. But instead of the normality of usualness, this week we had a Winter/Valentine’s Festival. There was a bounce house, cotton candy (made ahead of time by me, I was very sticky by the end and it looked like I had white hair), hot dogs, chips, cookies, a cake walk, Bingo, music, crafts, pin the kiss on the frog, a maze and general frivolity. It was a lot of fun to mix up the normal routine and to be able to interact with the kids in a slightly more casual context. I was in charge of Bingo, which surprisingly they were very excited about, it probably helped that the prize for winning was a sizable bag of candy. My throat was a little sore at the end of the night after having to speak above the sound of the music the entire time so that all of the kids could hear the numbers that I was calling out, but it was fun to see their excitement as their board was filling up and to have a good interaction with them. We ended our week with a nice, relaxing weekend that was much needed. The past couple of weekends have been about as busy as the weeks and we were all feeling a little drained. We went to a place called Urban Cookies on Sunday after lunch and got ourselves some delicious cupcakes. No offense to my grandmas, aunts, mom, sister or great-aunts but I had the best chocolate cupcake of my life there. As we are at the half way mark of our outreach we are trying to make the most of the time we have left, especially with the knowledge that March and April are going to be pretty busy months for us. In March we are heading to Mexico for around 10 days and right before that, several of our families are coming to visit us, and right after we get back from Mexico some other people’s families will be here. We then have vacation and a hiking trip to the Grand Canyon in April planned and soon after that we will be heading back to humid Ohio. When I look at our upcoming schedule, it’s easy for me to be overwhelmed by the seemingly little amount of time left here, but I as well as the rest of my team are trying to keep our focus on the here and now and the students and opportunities that we have right now with each of them. Thank you for your prayers over the months and for the support and love that you have sent our way. I am in the sunny and warm(ish) city of Phoenix. The sun has been shining almost every day and although I need to wear a jacket outside it feels very nice. I have felt many different emotions at being back in Phoenix. I feel excited, nervous, happy and a bit sad. As we drove into the valley and I saw the first glints of the sun shining off of the buildings downtown it brought tears to my eyes as memories of when I was here before came back to me. So far it feels very right being here and it feels like home. I love the smell and feel of the city and the feel of sunshine on my face. Our team is doing well and we are adjusting to our living quarters, different responsibilities and life here. 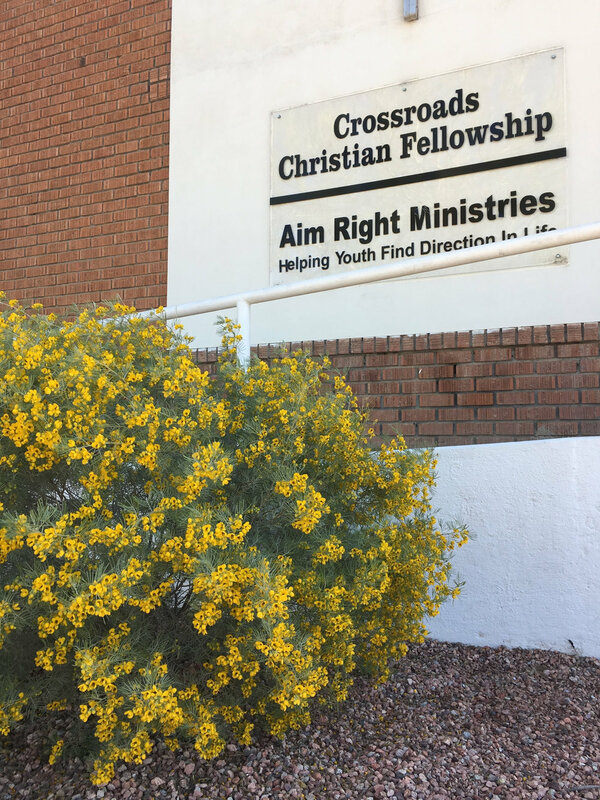 Aim Right Ministries is located in a church building and they have converted some of the classrooms upstairs into bedrooms for our team as well as their intern. Since we are living at Aim Right we are nice and close to where things happen and we don't have to worry about traffic which is really nice as the traffic is pretty bad which makes getting places take longer than it should. This first week the schedule has been different than it normally will be as we have been helping prep for the Christmas party for the neighborhood that Aim Right helps put on. But we have been able to start being in involved in City Night and Kingdom Kids which are some of the evening programs for kids and teens. We also have the opportunity to help with homework at the elementary school that is located across the street. 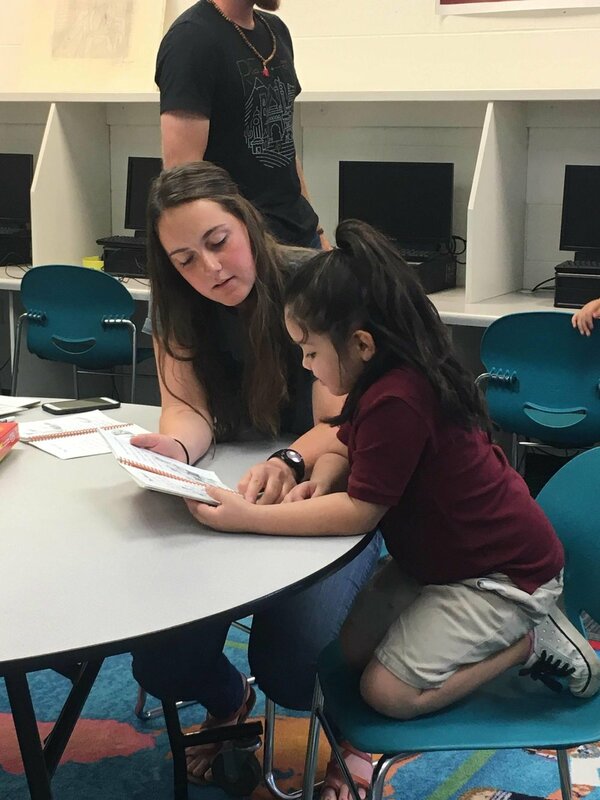 Aim Right has been doing a very good job at engaging with the teachers there as well as the kids and has become a large blessing to the school so I am looking forward to becoming more involved with that as well. As a team we have been able to see the Annual Christmas Lights Parade in downtown as have enjoyed a cookout at our Outreach Coordinator's house and met most of the other volunteers there as well. That was really fun for me as I already knew a lot of the people, and was able to catch up with them. So all in all we are enjoying settling in and becoming involved with everything and we are eager to see what God has for us here in the next 6 months. Thank you for all of your support and prayers, I love you all. Until next time. 3. Energy, to learn new schedule, names, people and how things operate. I am writing you all from Columbus, OH. What am I doing here you might ask? Well I am currently going through the REACH program and I am co-leading the Phoenix team. The first 3 months of this program in spent in OH at the training facility where we sit in on sessions every morning, volunteer at local ministries, have book studies, team debrief times, fun team times, intercession and many other things. 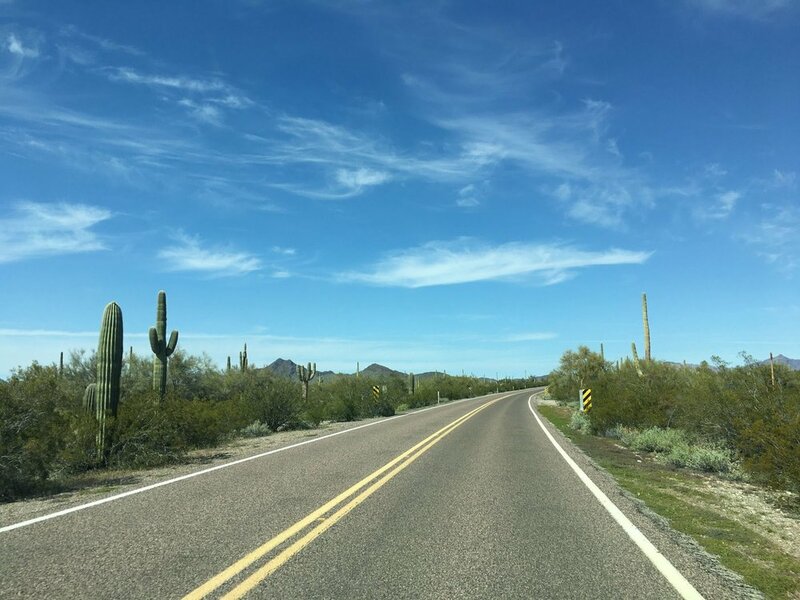 The next 6 months will be spent in AZ where we will be helping Aim Right Ministries with their different children's programs and various other things. I don't have exact details as of yet as to what we all we will be doing, but I will keep you updated. I am on a team with 5 other people and there are 31 in the program this year. My co-leader is Kelly Kauffman. Fun fact, she was on Trent's team when he led a team to Montana. And then we have Reylyn Yoder, Connor Oren, Karlee Lehman, and Katie Byler (no, we are not related). So in total our team is made up of 4 girls and 2 guys. I arrived in OH 3 weeks ago now as Team Leaders arrive 2 weeks before the other participants. We have had a little over 1 week now as a full team, and it has been going so great! I am enjoying getting to know each of my teammates and the fun times as well as the serious times we've had together have been really good. I don't have any pictures to post yet, but we will be taking team pictures here shortly and then I can show off my team. 1) That our team would continue to bond well and become really good friends and support for each other. 2) That I would have energy as I lead and plan and schedule different things. 3) That I as well as my team would be drawing closer to God and be listening to what He wants us to learn. 4) For excitement for our outreaches here in Columbus, and then in Phoenix as well. As I settle into life as a nanny in Wisconsin I know I don’t know all the reasons God has me here but I know He is still growing me and teaching me new lessons. With a newborn in the house I have had the privilege of sharing in the night time feedings. Often times in the quiet of the night Beckett lets out cries to be fed then latches on to the bottle as if his life depends on getting the contents into to his tummy. (Which I guess it does ;) That milk is the only thing that will satisfy him. 1 Peter 2:2-3 has continued to come to mind. “Like newborn infants, long for the pure spiritual milk, that by it you may grow up into salvation— if indeed you have tasted that the Lord is good.” I know for experienced parents this is nothing new but I am still in awe of how God uses that word picture. I look down at Beckett and realize that most time I don’t even come close to desiring time with Jesus and His Word as much as he desires the milk in the bottle. How often do I try to satisfy the hunger and thirsting of my soul with something else? I might even know it is not what I truly want or need but it seems easier at the time. I know those who belong to the Riverview have for the most part grown up in families that put importance on knowing God’s Word. Often times I took it for granted that others knew what I was talking about when I referred to a Bible story or quoted a verse to make a point or as encouragement. Yet as I have visited other churches and interacted with so many believers outside of the circles I am use to I see a great need in the church today to know the Word. People who have gone to church for years are still “drinking” the milk someone else is giving them instead of learning to “chew on the meat” they learn from the source itself. Nothing in life can replace the nourishment of God’s Word in our lives. Our spiritual lives depend on it. As the twins (three year old boys) looked at a Bible storybook that I had just finished reading to their little sister before putting her in bed I heard them say “Look he is pooping”. Glancing at the book I saw that the artist had draw Samson face with an expression that to toddlers getting potty train only made sense that he was in need of a toilet. I had to laugh as I saw they had a point. Yet in the days following my mind returned to that image and again I had to laugh to think that God chooses to use us to accomplish His great works on earth. How can that ever be captured in a picture? Samson’s story is a warning and encouragement to all of us. Caring for three toddlers and a newborn my days are filled with wiping sticky hands and runny noses, giving time outs and holding crying children, yet it is so much fun to be purposefully planting seeds in the minds of those precious children of truth that God can bring back to mind later on as He draws them to Himself. I have been blessed by those at Riverview who are taking the time to raise their children to love the Lord by modeling it to them in their own lives and using the every day to teach them about the great love that God has for us that He demonstrated with the cross. Because of the cross I live in hope each day knowing every task given me to do has worth when done for Him. This past week has felt crazy for me with everything that's been happening since the prayer tour and getting back on schedule, and with things back home. We had sat in on lectures the first two weeks of Leadership Intern Training with the YWAM staff, but last week we did our own team stuff in the mornings and then joined them for the rest of the day in our normal activities. We have enjoyed the team here and are sad to see them leave in 3 weeks for their outreach. They will be traveling to Southeast Asia and Pacific regions doing shows and ministering there, sleeping under the mango trees, etc. They have really taught me a lot about faith and just believing our Father will show up. I've appreciated them so much and enjoyed serving with them. They have been a huge blessing in my life. The mornings before lectures would start, our team plus the YWAM team would have a time of affirming each other and going through each person and encouraging them and praying for them. It was such a blessing for me, to receive that and to give that encouragement! This week we were also doing some prep work. We have a busy week coming up as we are hosting a tribal council appreciation meal, a Seder meal, and fundraising. Our team also got to go exploring one morning at Kerr Dam. That was fun to explore the trails and climb some rock faces, take pictures - oh, and try to scare one of our team members by running up to the edge or even just standing a few feet away from the edge. Ahem, Kelly. ;) Ahhh good times. Another thing this week was the guys’ second football game in their semi pro league, so we showed up to watch and cheer them on! Go monsters! (I’m not sure who picked the name.) I guess we need to work on our cheering, as we lost, but it was still a great experience to watch them play and see their hard work in action. This is a part of the sports ministry we do, besides the time we spend at the gym. So yeah, just be praying for us and thanks for reading!